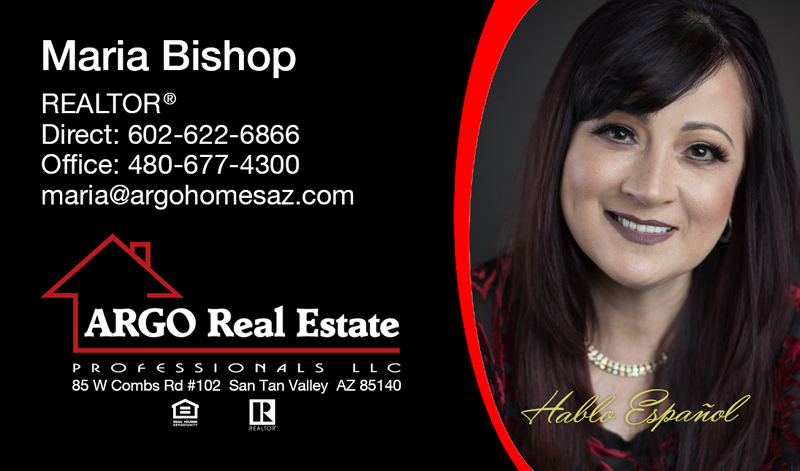 Maria Bishop is a full-service bi-lingual Realtor helping buyers and sellers during the process of buying or selling a home in the Southeast Valley of Arizona. Maria was born in Peru where she lived most of her early years and earned a technical degree in computers and systems. She worked many years at a private school where she also taught the use of software. Fluent in both English & Spanish, in 2008, she moved to Arizona, where she lives with her husband, her father and (3) of her children. Her oldest daughter and granddaughter live in Peru. Maria received her Real Estate license in 2013 and had the opportunity of working in the "flipping" business. Maria has always had a passion for helping others, and understanding firsthand how stressful the purchasing or selling of a home can be, she made the decision to help her clients with all of their real estate needs. In her free time, Maria enjoys time with her family, going out for lunch or dinner, shopping, or just enjoying the view from her backyard in San Tan Valley, where you can count the stars in the sky! buying or selling a house in the Southeast Valley of Arizona. all their real estate needs. count the stars in the sky!